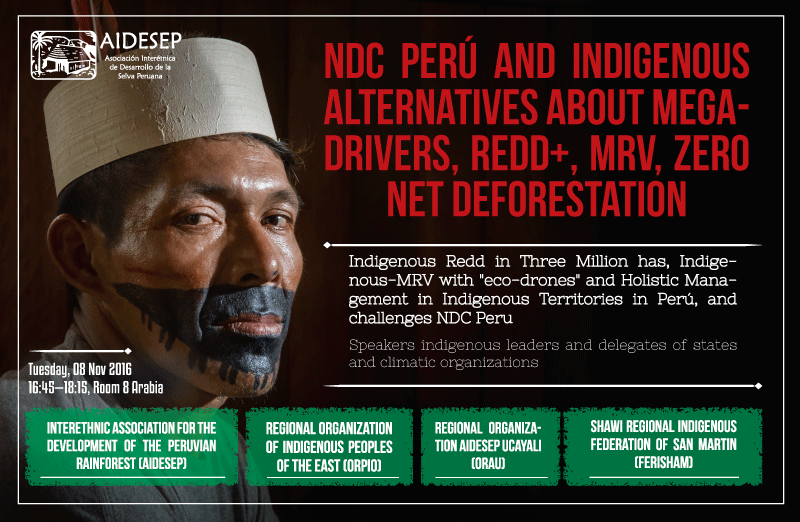 This panel event, which will be held at the 22nd Conference of the Parties in Marrakech, Morocco, will examine the impacts of REDD+ on indigenous territories in Peru, and the challenges faced by NDC Peru. Speakers for this event will include indigenous leaders, delegates from state governments, and representatives from climate organizations. This event is organized by the Interethnic Association for the Development of the Peruvian Rainforest (AIDESEP), Regional Organization of Indigenous Peoples of the East (ORPIO), Regional Organization AIDESEP Ucayali (ORAU), and the Shawi Regional Indigenous Federation of San Martin (FERISHAM).